With an 11" fuel-injected intake manifold flexing out of the top of a 502" big-inch Rat, the GMPP Ram Jet 502 is just plain cool. Not only attractive, the Ram Jet intake adds a significant amount of function to the big-block with amazing throttle response that you just have to experience to believe. Combining our aluminum-headed 502 with a modern fuel-injected intake results in 502 horsepower and 565 lb.-ft. of neck-snapping torque. With the Ram Jet intake, you also have over 500 lb.-ft. of torque available from 2200 rpm on up. Without question, that big, fuel injection intake stands out the most on the Ram Jet 502. Functional as it is attractive, the Ram Jet intake system enhances the already impressive torque band of the 502. The intake gobbles up air and stuffs it into the awaiting cylinders with incredible efficiency. 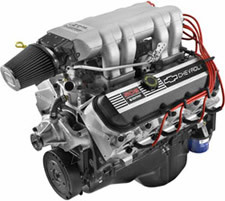 The impressive intake only sits a half-inch taller than a comparable carbureted system with a high-rise intake manifold, Holley four-barrel carb and air cleaner. The Ram Jet 502 features a 4.00" forged crankshaft, 4.47" forged aluminum pistons, forged rods, and a roller camshaft. The aluminum heads are our highly efficient oval-port intake design, and they utilize 2.25" intake and 1.88" exhaust valves. Underhood clearance at the throttle body should be checked for interference. The Ram Jet 502 requires a 12-volt power source (and ground), coolant, exhaust system, fuel feed and fuel return line (to the fuel tank). An in-tank fuel pump is recommended.